How the Saudis obtained the technological expertise necessary to build the facility is unclear, according to the report, though one potential supplier could be China, which has sold ballistic missiles to Saudi Arabia in the past and has helped supply ballistic missile production capabilities to other nations, particularly to Pakistan, whose military has forged deep institutional ties with the Saudi royal family since the 1980s. Regarding Saudi Arabia’s fervid desire to acquire nuclear and ballistic missile capabilities to match Iran’s military superiority in the Middle East region, the Washington Post report is not the only instance of its kind. 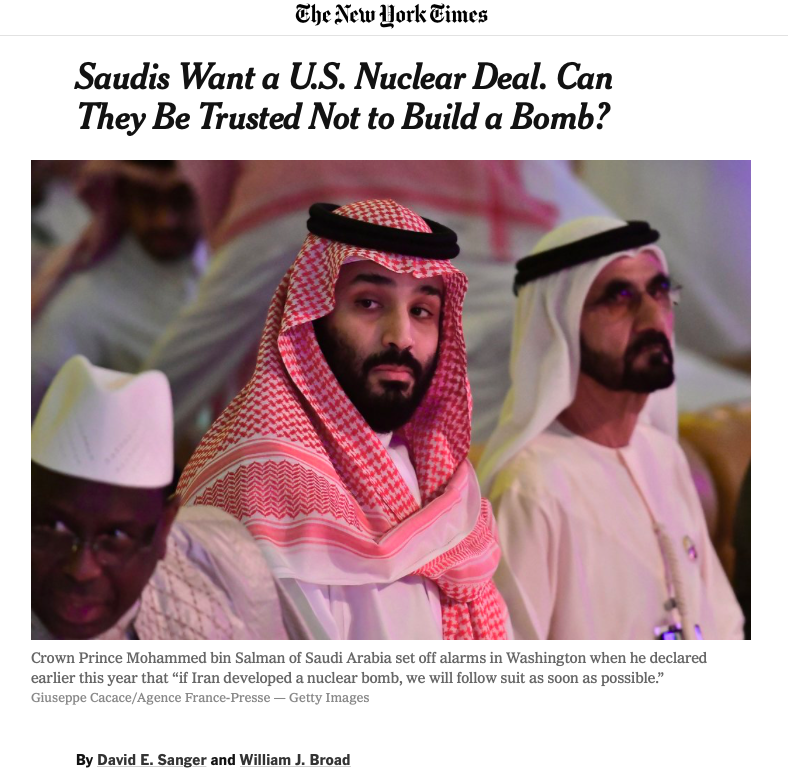 David Sanger and William Broad reported in The New York Times  in November that before Saudi Arabia’s Crown Prince Mohammed bin Salman was implicated in the killing of Jamal Khashoggi at the Saudi consulate in Istanbul on October 2, American intelligence agencies were trying to solve a separate mystery: was the prince laying the groundwork for building an atomic bomb? According to the New York Times report, the Saudi heir apparent had been overseeing negotiations with the US Energy Department to get Washington to sell designs for nuclear power plants to the kingdom. The deal was worth upward of $80 billion, depending on how many plants Saudi Arabia decided to build. But there was a hitch: Saudi Arabia insisted on producing its own nuclear fuel. Such fuel can be used for benign or military purposes: if uranium is enriched to 4 percent purity, it can fuel a power plant; at 90 percent, it can be used for a bomb. Saudi Arabia has vast uranium reserves and there are currently five nuclear research centers operating in the kingdom. Regarding Saudi Arabia’s clandestine nuclear activities, in November 2013, BBC’s defense correspondent, Mark Urban, published a report  that Pakistan’s military had made a secret deal with Saudi Arabia that in the event of Iran developing a nuclear weapon, Pakistan would provide ready-made nuclear warheads along with delivery systems to Saudi Arabia. Similarly, in 2004, it emerged during the investigation of Pakistan’s top nuclear scientist, Dr. Abdul Qadeer Khan, dubbed as “the father of Pakistan’s nuclear program,” that he had sold centrifuge designs to Iran, Libya and North Korea. Additionally, in recent years, Pakistan’s defense production industry, with Chinese assistance, has emerged as one of the most sophisticated military-industrial complex in the region. Not only does it provide state-of-the-art conventional weapons to the oil-rich Gulf states, but according to a May 2014 AFP report , Pakistan-made weapons were used in large quantities in Sri Lanka’s Northern Offensive of 2008-09 against the Tamil Tiger rebels. Moreover, in May last year, Pakistan’s former army chief, General Raheel Sharif, was appointed to lead a 40-member military alliance of Muslim nations dubbed as “The Muslim NATO.” Although the ostensible purpose of the alliance is to combat terrorism, in fact the alliance of Sunni Muslim nations was cobbled together by Saudi Arabia as a counterweight to Iran’s meddling in the Arab World, which Saudi Arabia regards as its own sphere of influence. Furthermore, it’s worth noting that Pakistan’s military and Saudi Arabia have forged very deep and institutionalized ties. Thousands of Pakistani retired and serving army officers work on deputations in the Gulf Arab States. And during the 1980s, when Saudi Arabia lacked an efficient intelligence set-up, Pakistan’s Inter-services Intelligence (ISI) virtually played the role of Saudi Arabia’s foreign intelligence service. Notwithstanding, the Trump administration recently announced the most stringent set of sanctions against Iran to appease Benjamin Netanyahu. Donald Trump has repeatedly said during the last two years that the Iran nuclear deal signed by the Obama administration in 2015 was an “unfair deal” that gave concessions to Iran without giving anything in return to the US. Unfortunately, there is a grain of truth in Trump’s statements because the Obama administration signed the Joint Comprehensive Plan of Action (JCPOA) with Iran in July 2015 under pressure, as Washington had bungled in its Middle East policy and it wanted Iran’s cooperation in Syria and Iraq to get a face-saving. In order to understand how the Obama administration bungled in Syria and Iraq, we should bear the background of Washington’s Middle East policy during the recent years in mind. The eight-year-long conflict in Syria that gave birth to scores of militant groups, including the Islamic State, and after the conflict spilled across the border into neighboring Iraq in early 2014 was directly responsible for the spate of Islamic State-inspired terror attacks in Europe from 2015 to 2017. If we look at the chain of events, the timing of the spate of terror attacks against the West was critical: the Islamic State overran Mosul in June 2014, the Obama Administration began conducting air strikes against the Islamic State’s targets in Iraq and Syria in August 2014, and after a lull of almost a decade since the Madrid and London bombings in 2004 and 2005, respectively, the first such incident of terrorism occurred on the Western soil at the offices of Charlie Hebdo in January 2015, and then the Islamic State carried out the audacious November 2015 Paris attacks, the March 2016 Brussels bombings, the June 2016 truck-ramming incident in Nice, and three horrific terror attacks took place in the United Kingdom within a span of less than three months in 2017, and after that the Islamic State carried out the Barcelona attack in August 2017, and then another truck-ramming atrocity occurred in Lower Manhattan in October 2017 that was also claimed by the Islamic State. Keeping this background of the quagmire created by the Obama administration in Syria and Iraq in mind, it becomes amply clear that the Obama administration desperately needed Iran’s cooperation in Syria and Iraq to salvage its botched policy of training and arming jihadists to topple the government in Syria that backfired and gave birth to the Islamic State that carried out some of the most audacious terror attacks in Europe from 2015 to 2017. Thus, Washington signed JCPOA in July 2015 that gave some concessions to Iran, and in return, the then hardliner Prime Minister of Iraq Nouri al-Maliki was forced out of power in September 2014 with Iran’s tacit approval and the moderate former Prime Minister Haider al-Abadi was appointed in his stead who gave permission to the US Air Force and ground troops to assist the Iraqi Armed Forces and allied militias to beat back the Islamic State from Mosul and Anbar. The Trump administration, however, is not hampered by the legacy of Obama administration and since the objective of defeating the Islamic State has already been achieved and Donald Trump gave indications of withdrawing American troops from Syria as early as April last year, though the long-awaited decision was finally announced on December 19, therefore Washington felt safe to annul the Iran nuclear deal in May 2018 and the crippling “third-party sanctions” have once again been put in place on Iran at Benjamin Netanyahu’s behest. Although the European Union is resisting the Trump administration’s pressure to cancel the Iran nuclear deal for now, the neocolonial world order is led by the United States; Europe will find no choice but to toe Washington’s line sooner or later. Can Saudi Arabia produce ballistic missiles? Saudi nuclear weapons ‘on order’ from Pakistan: BBC’s defense correspondent, Mark Urban.